The term FODMAPs refers to Fermentable Oligo-, Di- and Monosaccharides And Polyols. FODMAPs are poorly digestible carbohydrates, which are less readily absorbed in the small intestine, so they reach the large intestine where normal intestinal bacteria break them (ferment) into absorbable nutrients, for example, short-chain fatty acids or SCFAs) and gases. In the small intestine, FODMAPs attract water from the intestinal wall, which may result in loose stools or diarrhea. In the large intestine, normal colonic bacteria break FODMAPs into gases, which may cause bloating. Some people, mainly those with fructose malabsorption and irritable bowel syndrome (IBS) may experience abdominal bloating or pain, excessive burping (belching), excessive gas (flatulence) and loose stools or diarrhea after consuming even small amounts of FODMAPs. Individuals with fructose malabsorption, lactose intolerance, small intestinal bacterial overgrowth (SIBO) and irritable bowel syndrome (IBS) with a positive breath test with fructose or lactose are most likely to benefit from a low-FODMAP diet [4,5]. Chart 1 sources: [1,2,3,7] Legend: FOS = fructo-oligosaccharides; GOS = galacto-oligosaccharides; HFCS = high fructose corn syrup. Alcoholic and caffeinated beverages may aggravate IBS. NOTE: The list is very strict but not complete. 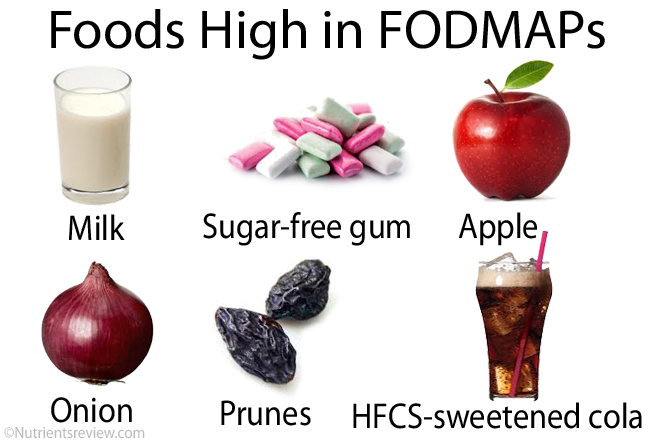 The foods highest in FODMAPs are in bold. How to start a low-FODMAP diet? First, try to get a diagnosis on the basis of a breath test from an experienced gastroenterologist. Next, try to find an experienced registered dietitian who will likely recommend you to avoid all foods high in FODMAPs for several weeks and later a less strict diet to determine how much of foods high in FODMAPs you can tolerate. 1. Does cooking reduces the FODMAP content of foods? Cooking, canning and pickling may reduce the amount of FODMAPs but not enough that we could recommend them as methods to avoid FODMAPs. 2. I started a low-FODMAP diet but I still experience bloating and diarrhea. Why? If you have fructose malabsorption, elimination of FODMAPs should result in improvement of symptoms within few days; complete resolution of symptoms may last for several weeks. If you have irritable bowel syndrome (IBS), a low-FODMAP diet may help you or not. A low-FODMAP diet can improve symptoms in small intestinal bacterial overgrowth (SIBO), celiac disease and Crohn’s disease, but not completely, so the underlying diseases need to be treated. 3. Except FODMAPs, which other food ingredients commonly trigger gastrointestinal symptoms? Insoluble fiber in whole grain cereals, legumes, guava, avocado may worsen symptoms of irritable bowel syndrome. Gluten triggers diarrhea in celiac disease. Allergens from milk, soy, nuts, wheat, fish, shellfish, other foods, supplements or drugs can trigger allergic reactions in sensitive individuals. Certain amino acids and polysaccharides are harmful for individuals with certain genetic disorders of metabolism. Some foods may not agree with you from psychological reasons or from no apparent cause. 4. Any tips to easier follow a low-FODMAP diet? Try stop eating all sweet foods and milk products. This way you may avoid craving for sugar. jms, I appreciate, I edited accordingly. Hello, the list is very useful. Thank you! Alessandra, isomaltulose has a similar composition as sucrose (glucose + fructose) and like sucrose is completely (but more slowly) absorbed; according to some tests, healthy individuals can consume 50 grams of it per serving without having any GIT problems. We have an article about isomaltulose here. I have found only one vague statement about isomaltulose, which is on the Australian Food Standards website: “anyone with fructose malabsorption may also be affected.” I’m now adding isomaltulose into safe to eat category. Alessandra, from what I know, only the individuals with hereditary fructose intolerance (HFI) and saccharase-isomaltase deficiency (both are very rare genetic disorders) are known to have problems after consumption of isomaltulose. I am puzzled about potatos and bananas being ok when I am told they are high in resistant starch? Also another site lists 30g of chocolate per day as ok but ruled out here? Freshly cooked potatoes do not contain that much resistant starches; they are cooked and cooled potatoes that do. Ripe bananas do not contain a lot of resistant starch, they are unripe (green) bananas and plantains that do. Here’s an article about resistant starch. Resistant starches are polysaccharides. They are fermentable fiber, so they have “F” from FODMAPs, but FODMAPs include only Oligo-, Di-, and Monosacchardides, not Polysaccharides, so resistant starches are officially not considered FODMAPs. Here’s a short explanation (by one of the pioneers of the FODMAP concept) why resistant starches are not FODMAPs: it’s because they are slowly fermentable and therefore do not cause much gas. Milk chocolate contains lactose, which is a FODMAP, so I’ve put it into “to avoid” column. Obviously, chocolate contains only little milk, so very little lactose, which should not be a problem for most–even lactose intolerant–people. I do not have “to try” column in the chart, so everything I’ve put into “to avoid” column comes out more strict. Thank you kindly for your trouble. I find baked vegetables like potatoes easier to tolerate than steamed or pureed in soups which cause me enormous bloating. I’m not sure if there is any difference between baked and steamed vegetables, when it comes to bloating. It’s more likely you get bloated from other vegetables in the soups, which are high in soluble fiber (beans, peas, cauliflower, broccoli…). But some foods in certain forms can irritate you from no obvious reason. You can try steamed potatoes alone without having other vegetables for two days and see what happens. Could you please elaborate on Oligosaccharides being good for babies’ gut? Also, how is this connected to inulin. Thank you. Oligosaccharides are considered prebiotics – they stimulate the growth of beneficial bacteria in the large intestine. Lately, it is a lot of rumors how oligosaccharides are beneficial for infants, but for me, it’s too early to make any conclusions. Inulin is a polysaccharide (contains more than 10 sugar units), but it is fermentable by the normal intestinal bacteria the same way as fructo-oligosaccharides are, so it is considered as prebiotic. You can search for studies on this topics here. Expanding on Oligosaccharides and IBS, The Pre-Biotics that I’ve been looking at to improve my gut have oligosaccharides in them. One brand has Acacia Inulin in it. If Oligosaccarides and Inulin are supposed to be avoided for IBS sufferers, by following the FODMAP diet, shouldn’t these fibres be avoided as pre-biotics? And if so, it there no hope to get prebiotics into the large intestine to help good bacteria grow for us IBS sufferers? “FODMAPs” is an idea, a concept, they are not bad by itself or bad to everyone with IBS. “Prebiotics” are substances that have a certain arbitrarily determined measurable effect on the growth of beneficial bacteria. There are many other nutrients (mainly from plant foods) that feed beneficial bacteria, but are officially not considered prebiotics. You do not need to worry about prebiotics and you can still have enough beneficial bacteria. Can margarine with plant sterols(Becel Proactive) be eaten on a low fodmap diet? Also, many dairy products such as ice cream and cheese are lactose free. I find that if I need to eat foods or med’s containing lactose, taking an ultra strength lactaid tablet is very helpful. Thanks for the valuable information. Plant sterols are not FODMAPs. Gums are soluble fiber. Normal bacteria in large intestine breaks down this fiber and produce gas. The gas can cause pain. Would agar-agar be high in FODMAP’s? Would there be any amount that would NOT trigger a problem, by chance? Thank you, I appreciate your site and time! Agar-agar contains fermentable soluble fiber, so yes, it is a FODMAP. The amount at which it could cause problems may differ from person to person a lot, so it’s to try and see.